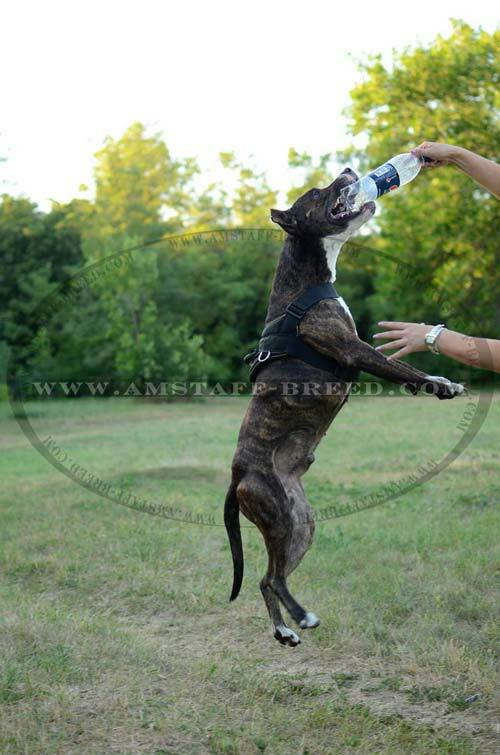 Would you like to keep your Amstaff dog always in great physical shape? Are you looking for the best way to build his muscles? 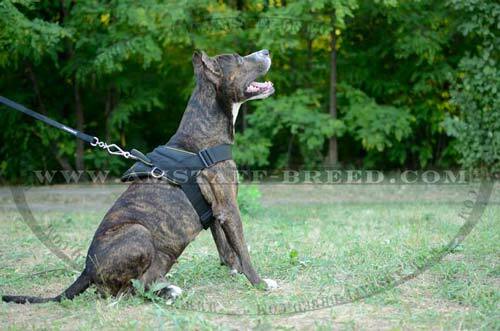 Provide your pet with professional training harness and try pulling activities! You will be amazed with the results! 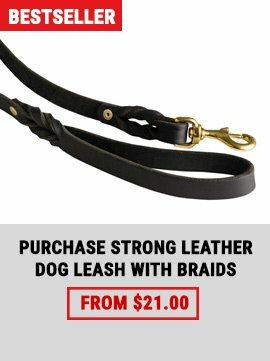 Excellent harness for daily use! 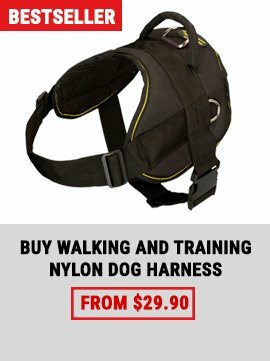 Great training harness for your Amstaff! This harness has been elaborated especially for wide range of pulling activities as hard freighting, sledding, skijoring, and tracking work as well. 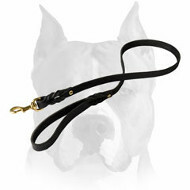 Its snug, lightweight design will help your Amstaff to handle easily all these hard duties. 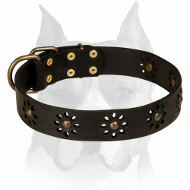 - The straps are wide enough to avoid cutting into your dog’s skin and rubbing. 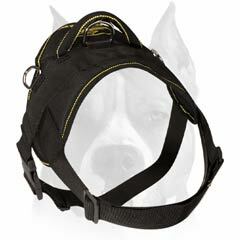 Your pet will feel at ease wearing this snug harness. 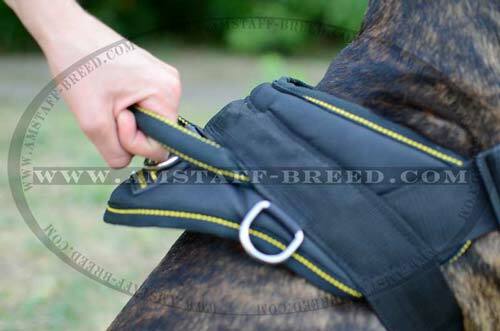 - The shape of the back part will help to distribute the tension in the optimal way so as your dog will not almost feel it. - Would you like to control your dog better? It is possible with special be-in-control handle attached at the back part of the harness. 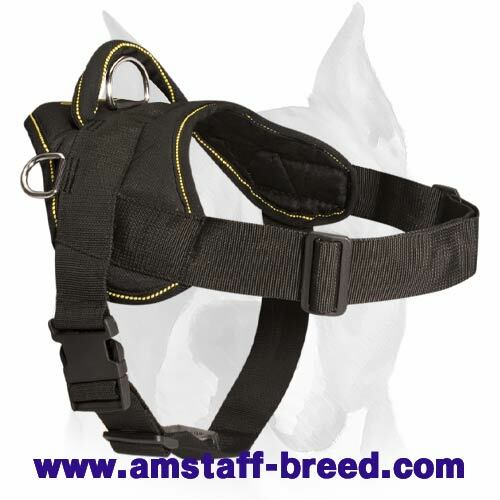 - The harness is 2 ways adjustable. 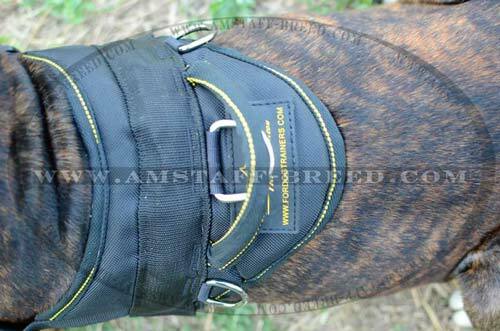 You will be able to fix it for the best fit and put it on your pet very easily using quick release buckle. 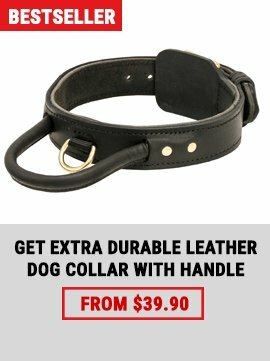 - The harness is equipped with rust-proof nickel plated rings, one for attaching a leash and two side rings for connecting a cargo. - You can upgrade this harness with reflective trim that will be especially suitable if you like night walking and training with your Amstaff. - Durability of this harness has been tested and proved by dog trainers and our numerous clients. Due to the high-quality nylon this harness is made of, it performs increased wear-and-tear resistance and all weather capabilities. You will be pleased with quality and usability of harness that will help your Amstaff dog to be more efficient in training!